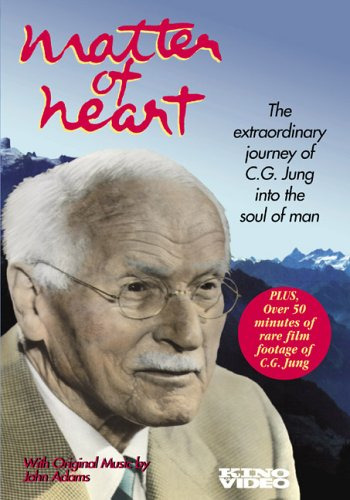 "Matter of Heart: the extraordinary journey of C.G.Jung into the soul of man"
"Matter of Heart” is a compelling portrait of Carl Gustav Jung, whose extraordinary genius and humanity reached far beyond the sometimes exclusive realm of psychiatry into redefining the essential nature of who we are and what we hope to become. More than a linear biography, the film presents a fuller perspective on this humanist, healer, friend, and mentor, through the skillful interweaving of rare home movies, valuable archival footage, and a wealth of interviews with such notables as Sir Laurens van der Post, Marie-Louise von Franz, and Joseph Henderson, M.D." Other interviewees include Barbara Hannah, Liliane Frey-Rohn, Heinrich Fierz, and Baroness Vera von der Heydt. The film is directed by Mark Whitney, written by Suzanne Wagner, with original music by John Adams.